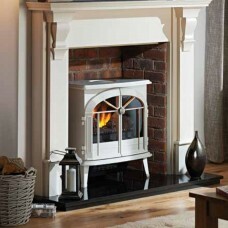 A traditional stove is a great way to give your home a cosy look and a warm feel. Electric stoves provide consistent, clean heat and are great for those who would like to include a stove in their home without the hassle and expense of traditional wood or coal burning stoves. 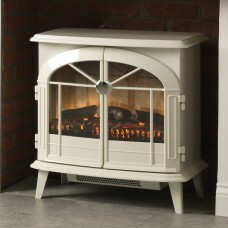 Electric stoves can be a great addition to any room. They are freestanding, easy to install and ideal for tight spaces. They often come with variable heat settings, so you can keep your room at just the right temperature (and some have a remote control). Often the heat can be used separately from the flame effect, so you can have the fire effect any time you want it, even in warmer weather. 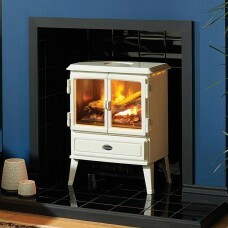 Electric stoves are either log or coal effect, adding to their authenticity. 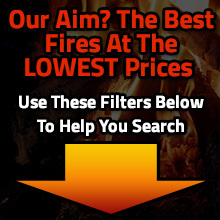 They use a range of different types of flame effect technology, including Optiflame and Variflame. Gas stoves are stylish, authentic and easy to use. They can provide any home with a traditional looking method of heating which uses modern technology and can fit with either a traditional or contemporary look. Some are clean and modern looking, while others are more ornate. While wood and coal burning stoves can be difficult to use for those not used to them, gas stoves can be used by anyone. They are highly efficient, with most of the heat generated by them finding its way into your room, rather than up the chimney. Some come with a log effect and others with coal. Most gas stoves are highly adaptable and adjustable, some of them with a remote control. You can vary flame height and type as well as heat output on some of our stoves. Some are made of traditional cast iron, which adds to their authenticity and quality feel. Multifuel stoves are very similar to woodburning stoves in regards to appearance and design but can burn coal, wood pellets and peat as well as wood. These stoves are perfect for larger rooms as they offer high heat outputs and can also be connected to a radiator to in case space heating in the home. © 2018 Fireplaces 4 Life. All Rights Reserved.